The world requires an increasing number of underground facilities for applications such as storage, waste repositories and traffic. Accurate prediction of the stability and deformation of these facilities is essential, and calls for model calculations using reliable and comprehensive constitutive equations describing the mechanical behaviour of the rocks involved, particularly the time-dependent effects. Here the authors combine their knowledge and personal experience in this field to encourage the practical use of material laws based on a sound physical and mathematical basis. Further discussion and research on the time-dependent behaviour of rocks and related materials is supported in the text by more than 200 figures. The text covers elasticity, creep, dilatancy, creep failure and short term failure, experimental techniques and test results, micromechanical deformation mechanisms, viscoplasticity and computation using appropriate constitutive equations, including many fundamental model calculations. Rock mechanics incorporates aspects of many disciplines including structural geology, soil mechanics, material sciences, civil, mining and petroleum engineering, seismology and geophysics. This book will therefore find a wide appreciation amongst engineers, researchers and graduate students in these and other related areas. N. D. Cristescu is the author of Time Effects in Rock Mechanics, published by Wiley. 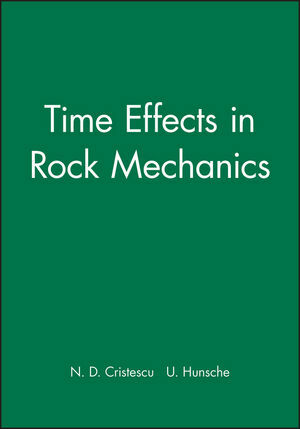 U. Hunsche is the author of Time Effects in Rock Mechanics, published by Wiley. Rheological Constitutive Equations for Rocks. Mining and Petroleum Engineering Problems. Closure and Failure of Vertical Caverns and Boreholes. Creep, Closure and Damage of Horizontal Tunnels. Creep, Damage and Failure Around Rectangular-Like Galleries orCaverns.